Home / Resources / Residential Security / Locked out of your house, now what? I Locked the Keys out of My House, What Should I Do? There are few Americans that haven’t dealt with the frustration they feel when they are locked out of their own homes. While it’s tempting to remove a screen or break in through a broken door, the damage you can do to your home may cost you more than a call to a residential locksmith. Add to this the fact that your neighbors may think you are entering the house illegally and may call the police and you’re looking at a complicated situation. The next time you are locked out of your home and your keys are nowhere to be found, follow these simple steps to ensure that your night or day isn’t completely ruined. Find a 24 hr locksmith before you need one. 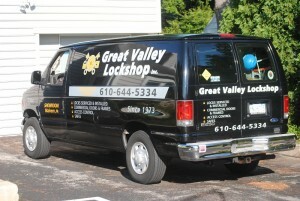 Great Valley Lockshop has 24 hour emergency service available. Keep our number with you at all times, in your wallet or in your cell phone: 610-624-3802. If you have our information handy, you won’t feel quite as much panic when you realize your keys are on the wrong side of the door. When you call a locksmith company, ask for specifics about the company. Be wary of any company that answers the phone with a generic greeting, and the FTC recommends that consumers ask for the full name and address of the business. This gives you a chance to verify that the residential locksmith is actually a local company as they profess to be. Great Valley Lockshop is a legit locksmith that has been in business for over 30 years servicing countless happy customers. When your locksmith arrives, make sure they are in a company car or vehicle. Some locksmiths may work out of a personal vehicle or van, but most will show up in a vehicle that is clearly marked with the name of the company you called for service. If it’s an emergency job, a locksmith is more likely to show up in a personal car. Great Valley Lockshop has a fleet of company vans all with the company information clearly displayed on our trucks. When your locksmith starts the process of opening your doors, be aware that protocol is to attempt to pick the lock before the locksmith attempts to drill it. If your locksmith is performing a service, feel free to ask questions about the particulars and what you can expect from the process. Any time you let a service professional into your home, you should request the proper identification papers and documents. Certain states require that locksmiths be licensed, and you should always feel free to request the license number from your locksmith. Before the locksmith attempts to open your doors, they should also ask you for identification. According to most experts, the standard procedure for locksmiths is to ensure that you live at the home before attempting to open the doors. While it can seem like the end of the world, millions of people lock themselves out of their homes every day. With Great Valley Lockshop on speed dial, the process can be greatly simplified and your entire night won’t be ruined. Call us at 610-644-5334 or request a free estimate!